If you’ve just stumbled upon this post, this is actually the second in a series where I’m sharing my reasons for launching a secret pen name. Reason #3 – I wanted my crayons back. Today I’ll be talking about Reason #2. Let me start by saying that my purpose in this post is to share my personal experience and to help others carefully consider the choices they’re making. Your results may vary. Don’t start to blog or stop blogging because I (or anyone else) tell you to. Don’t change your social media strategy because I (or anyone else) tell you to. Research your options, test things for yourself, and make the decision that works best for you. And be willing to adapt. The publishing world is in constant flux, so what works today might not work tomorrow. An additional caveat is that I’m talking in this post about selling fiction. I’m not talking about selling non-fiction. They are different. If you’re writing non-fiction, I think a blog is essential. One of my reasons for launching a pen name was that I wanted to run an experiment. The single biggest obstacle faced by all authors is visibility. In order for people to buy our books, they need to know our books exist. The most common answer to the visibility problem is “build a platform.” We’re supposed to blog and we’re supposed to be on social media to build relationships with potential future readers. We don’t need to be on all the sites, but we should pick one or two to focus on. I’ve said as much myself in the past. But now, years into blogging and my social media platform, I’ve started to wonder if there are a few flaws with this idea. (1) It doesn’t always work. Yes, I realize there are no guarantees in anything and the quality of the book matters, but I’ve seen authors who’d built up their platforms launch novels and have few sales. I’ve also seen authors launch novels that had a quick spike in sales but then didn’t stick in the rankings. From my (non-scientific) observation, it seems that blogging is much more effective at selling non-fiction books than it is at selling novels. I also have a theory that blogging attracts people who like you, but it doesn’t necessarily attract people who like to read in the genre you write. I read blogs by people whose books I’ll never buy. Or, if I buy one of their books, it’s simply because I want to support them. But even if people buy our book simply to support us, that’s not necessarily beneficial to us in the long-term. Those loyalty sales confuse Amazon’s algorithms about what type of people will actually like our book. (2) Blogging and social media eat away at the time needed to write books. I understand that blogging hones our non-fiction writing skills and teaches us to meet deadlines. It doesn’t teach us to be better fiction writers, though, and most of us have a limited amount of time to devote to writing. (3) It seems to have a high burn-out factor. I blogged and was on social media for years before I ever had anything to sell. That was fine when it came to the writing-related posts because I was also a developmental fiction editor so I was still building my business and helping other writers. It wasn’t working out the same way when it came to the other posts. One of the reasons I took a break from my scifi and fantasy posts last year was that I realized I was burning out. I was using up my ideas long before my fantasy novels were available for sale, and I felt like I was starting to repeat things I’d already said. Honestly, I like a quiet life. Crazy-exciting things just don’t happen to me every day. My husband and I play board games and go for walks. We take care of my elderly grandparents. We live outside of the city limits and some days the most thrilling thing that happens is we splurge and drive into town to buy a cup of coffee. This past year, I could have written a lot about doctors and specialists and the best time to visit an emergency room, but that’s not the kind of material people on social media want to hear either. Until I have a book out, my potential topics are finite (at least if I want to be genuine and authentic to me and to what I enjoy writing about). I’ve noticed that many people who start to blog, even when their blogs are great and they’re doing it exactly like the experts tell them to, burn out before they ever have a book to share. Some of them end up never having a book to share. I saw myself walking that path, and it frightened me. (4) Readers who love our books would probably rather we were working on the next book instead of blogging or being on social media. If social media is about discoverability, then perhaps there’s a threshold at which it stops being useful. Social media and blogging might be more useful when we’re unknown, and less useful once we have a fan base. Once we have readers, the single best way to continue growing our readership is to write more books, not to write another blog or spend time on social media. And now, in hindsight, I can tell you that I’ve never received an email saying “will you please blog more?” but I have received emails asking when the next book will be out or encouraging me to write faster. 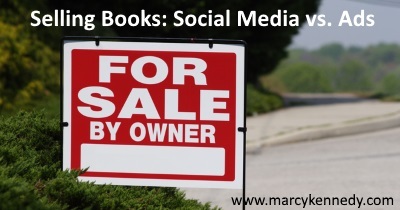 Readers want books more than they want blog posts or Facebook status updates. Please understand—I’m not anti-blogging or anti-social media. Obviously, I’m blogging right now. Some people enjoy social media. Some people enjoy blogging. I have times when I love them and times when I hate them. If you’re someone who enjoys blogging and social media then all of the points above are moot. Do it because you love it…but understand why you’re doing it. If we don’t enjoy it, then I think we need to consider whether there are other more profitable or equally profitable ways we could be spending our time. I also see the value in using social media options like Facebook groups as a networking and learning resource. I’ve been involved in fantastic group promos because of Facebook connections, and I’ve also gleaned amazing tips about writing and marketing from my fellow writers in those groups. But, again, that’s a different way of using social media. It’s not about connecting with potential future readers. Bottom Line – I just wasn’t convinced anymore that blogging and social media were the only way (or the best way) to gain and keep visibility for our fiction writing and to connect with fiction readers. Since I have an established platform under my real name, I couldn’t test this theory at all as me. Enter the pen name experiment. In fact, the need to start a second platform is one of the main arguments levied against pen names, especially private ones. For other reasons, I’d fallen in love with the idea of pen names, but I knew they’d only be a viable option for me (and many others) if they didn’t require a second high-maintenance platform. I did set up a website for my pen name because I think it’s important for an author to have an online home where readers can find out more about them and email them. It has blogging capabilities, but I plan to use the blog mainly to share excerpts and announce new releases. I also created a Facebook page for her, but it’s only there as a way to connect with readers after they’ve read the books. I’m not using it to try to “meet” new people. In other words, all the online presence I set up for her was intended for engaging readers further after they already knew about her, not about gaining name recognition or building a platform pre-release. However, I’m also not a believer in the Field of Dreams version of building an author career. They won’t come simply because you build it. Even if they did, it’d take years. I wasn’t about to wait years. I’m self-employed. If I spend time on something, it’d better help pay my bills pronto. So I decided that my pen name would experiment with ads. Ads tend to split writers down the middle. Some people say ads don’t sell books, and a lot of writers have lost a lot of money trying them. Other people swear by ads and credit them with making their career. The big three when it comes to ads (as of early 2017 when I’m writing this) seem to be Facebook ads, Amazon ads, and email newsletter ads (the best-known being BookBub). I lost money on the Facebook ads. (And before anyone assumes that it’s just because I didn’t know what I was doing, I’ve taken Mark Dawson’s paid Facebook course.) This could have been due to the genre I’m writing in, or it could be that the Facebook ad market is now so glutted with authors that it’s going to become even more difficult than usual to get a positive ROI. I don’t know. All I know is that it didn’t work for me. It also didn’t work for my non-fiction books under my real name, so I’m leaning toward the platform being overly crowded as the reason. The first month I broke even with the Amazon ads, but now they’re giving me a positive ROI. I wonder, though, if they’ll soon experience the same over-population as Facebook ads and lose their effectiveness, especially after Mark Dawson adds a module to his course about them. I got a slot in two mid-sized email newsletters that accept new releases (not all do). In the first week, my pen name’s Book 1 ended up in the top 100 of its category and peaked at the rank of #2,243 overall on Amazon. The first month after it was released, it outsold all my other books…combined. Since then, it’s stuck high enough that it’s still my bestseller by far. It comes down to the age-old divide that you can either invest time to get something done or invest money. For me, the monetary cost was worth it when launching my pen name. Time is a finite resource, and if the past year has taught me anything, it’s that I want to savor every moment I have. That doesn’t mean my choice is the right one for everyone. You might choose to solve the visibility problem by building an online platform first. My whole point here is this: know that you have options and make a thoughtful, strategic choice about what will work best for your life and your career. I’d love to hear your thoughts. Do you think blogging helps fiction authors sell books? Do you think blogging and social media shouldn’t be used as a way to sell books and instead should be done for a different reason? What has your experience been with ads and other promotional opportunities?